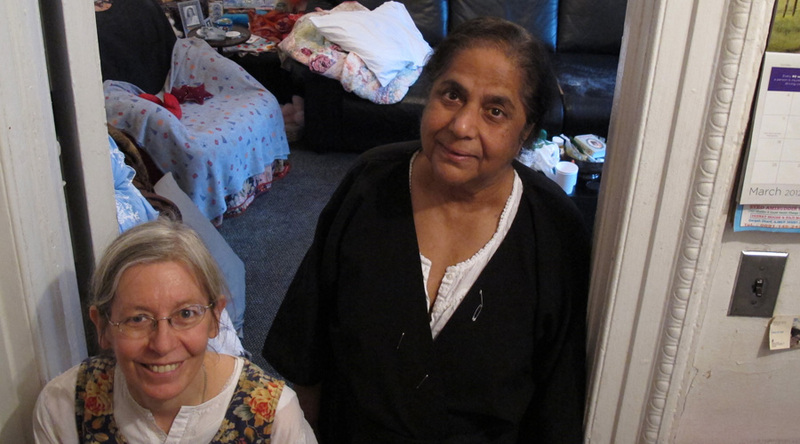 Habiba Ali and Pamela Downing inside their apartment at the Hotel Wales. Upper East Side, New York — They call themselves permanents. Habiba Ali, 63, and Pamela Downing, 55, share a room at the end of a long, musty hallway in a boutique hotel on Manhattan’s Upper East Side. Excepting one other resident, they are the last of their kind. Nostalgia, inertia and low rent keep some New Yorkers tied to their neighborhoods as the world around them changes. When Ali and Downing first moved into the Hotel Wales in the 1980’s, on Madison Avenue between 92nd and 93rd Street, the building was shabby and certainly wouldn’t have attracted tourists, but it was well situated. Theirs was the neighborhood of Jacqueline Kennedy Onassis, the Marx Brothers, Woody Allen, and Paul Newman. Carnegie Hill, the stretch of blocks from 86th Street to 98th Street is named after the steel king, Andrew Carnegie. Ali and Downing, hardly millionaires, managed to live among Manhattan’s wealthiest and most admired families for nearly three decades. Today the hotel has been renovated and an overnight stay costs around $200. While many of the neighborhood’s more famous residents have died or left, the streets and stores still exude an air of entitlement. Ali and Downing’s lifestyle is anything but: their apartment is rent-controlled. Ali and Downing pay less in monthly rent than a guest of the hotel might pay for a week’s visit. No wonder they’ve stayed for nearly three decades. “We live in a posh five star hotel with no pennies in the pocket,” said Ali, who came to New York from Pakistan 1979, just after her father passed away. Her plan was to complete a six-month course at the Pratt Institute’s School of Art and Design. She formed a close friendship with a French American woman Kathleen LePercq. The stranger was sympathetic to Ali, who didn’t know many people and was still mourning her father. LePercq helped her to obtain a visa and ultimately her citizenship. Ali moved into the building in 1984, paying $225 a week. Downing, a legal assistant, joined her the following year. The price increased by $35. Today, they won’t share their precise rent, but by Manhattan standards it is absurdly inexpensive. Still, there are months when they have struggled to pay for it. When that happens, their families help. The hotel may be posh, but their apartment certainly isn’t. It totals 450 square feet, comprising one bedroom, a narrow kitchen, and a bathroom. If a guest of the hotel were to accidentally step inside their apartment, he or she would not confuse it with their own room for a second. The sheer amount of stuff that is stacked on the floor or counter, nailed, taped or draped on the wall, is overwhelming. There is only one bed and it is Ali’s. Downing prefers the floor. She points to a folded up mat and blankets set beside a bureau, her bed. At a small table near the wall, opposite the window and bed is a veritable shrine to Ali’s parents, Dr. Riaz Ali and Begum Amuzzinah Ali. Beside their framed photos are portraits of Kathleen LePercq, Ali’s “American mother” and mentor. “My father was a doctor first. So, I grew up in a home where I didn’t know much about what difficulties are going to be,” Ali said. Her concept of America came from magazines like Vogue and Better Homes and Gardens. “I didn’t think there was poverty in New York,” she said. Downing’s childhood was very different from Ali’s. There was no television in her house, no store-bought toys and no alcohol. She was brought up as a Seventh Day Adventist. She actually did sleep on the floor in childhood as well, underneath a piano, oddly enough. Downing said the pets she kept in a bedroom she shared with her sister chewed too loudly at night. Instead of moving their cages from her bedroom, she moved herself. Downing came to New York after graduating college, to satisfy her curiosity about the city and perhaps to test her mettle. Ali and Downing met at the Church of the Holy Redeemer, where Downing stayed in the community’s retreat house. She cooked meals for guests and managed the library. Ali and her colleagues from Pratt came for a tour of the church . The two women connected, after discovering they had a mutual friend, and met often for lunch and walks. “We clicked to each other,” said Ali. When her job at the Most Holy Redeemer Church ended, Downing still wanted to explore parts of the city she hadn’t seen. “I’m a great procrastinator,” said Downing. “So, Habiba said ‘Why don’t you come and park your bags at my place,’” Downing said. The two have not lived apart since. Downing looks like a schoolgirl from a bygone era. She wears her own kind of uniform every day: a long floral jumper over a blouse or other long-sleeved dress, her greying hair parted and clasped in a neat low ponytail, and glasses. Her favorite joke is a pun involving papal edicts. Her favorite childhood story was Alice in Wonderland. She read it in Latin. And for years she has inventoried the flora and fauna of Central Park. For nearly two decades, She worked in the same downtown office before retiring. Ali wears a black canvas dress, like a judge’s robe, only short-sleeved with a blouse underneath and a cast on one arm—she fractured it in a fall. Her hair is swept into a bun, her eyes dark and observant. She speaks quickly tumbling over her words as if worried someone will interrupt her and occasionally Downing does. When a guest or other listener looks confused by something Ali says or when Ali struggles to find the correct word, Downing inserts herself into the conversation. Neither has taken the traditional route of marriage and raising a family, though Downing has certainly thought about how her life might have been different. “In a way I regret that I never did get married and have kids, but you know it’s too late now,” she laughed. “You can do it,” said Ali. “I’m too old. My knees won’t let me,” said Downing. Fortunately Downing said she never felt any pressure or judgment from her relatives. “My family was always very unconventional and certainly nobody would judge anybody for how they wanted to live,” she said. In the late eighties, the building’s first owner, Mr. Bernard Goldberg, converted 1295 Madison Ave. from an apartment building and transient lodging house to the elegant Hotel Wales. “Mr. Goldberg was a gentleman, a very nice man. He called all the permanents and asked them if they want to go,” said Ali But to Ali and Downing he suggested, ““Just stay quiet and pay my rent on time.” He sensed that they if they left they would not be happy some place else. They agreed. At that time, only 15 residents considered the hotel home. Most agreed to be compensated by Goldbeg and left. The others died. Today, guests change day-to-day, owners change every few years, and even the hallway art changes– Downing recalls sketches of Puss in Boots, from the famous children’s illustrator Alain Vaes. Twenty-seven years later ,the only fixtures in the building are Downing and Ali. Living there is also comfortable. Ali doesn’t have to cook or clean. The hotel provides clean linens every week. There is a tea room, a rooftop garden and a large dining room on the second floor that where they can entertain friends as long as the hotel guests don’t need the space. If there’s a problem, Ali will phone management and complain. They have defined roles. Downing cleans and fixes things. Ali supervises and on occasion, she cooks. Sometimes, Ali, who is older, admonishes Downing for not doing something Ali asked, like cleaning dishes or not following precise directions. “I sometimes feel that I get scolded unfairly when bad things happen with which I’m in some remote way connected,” said Downing. But Ali apparently gets her share of scolding too, from her own family.